SEATTLE, Wash. – The number one seeds dominated at the National Volleyball League Seattle Championships with Dave Palm & Eric Zaun and Brooke Niles & Karolina Sowala taking home titles. Both teams won straight matches in extreme weather conditions throughout the weekend to get into the finals on Sunday. Coming off a victory at the Hermosa Beach Championships, Palm/Zaun won another hard-fought three game match going 21-18, 11-21, 16-14 over No. 7 seed Drew Mallin & Ryan Vandenburg. This is Palm’s third win in 2015, partnering with Mike Placek for the Panama City Beach Championships to defeat Erik Haddock and Roberto Rodriguez-Bertran. Niles/Sowala conquered No. 2 seed and reigning women’s champions Vivian Cunha & Raquel Goncalves Ferreira, 10-21, 21-19, 15-10. Niles/Sowala opened the season with a win at the Panama City Beach Championships, defeating Cunha/Ferreira in a close two game match. 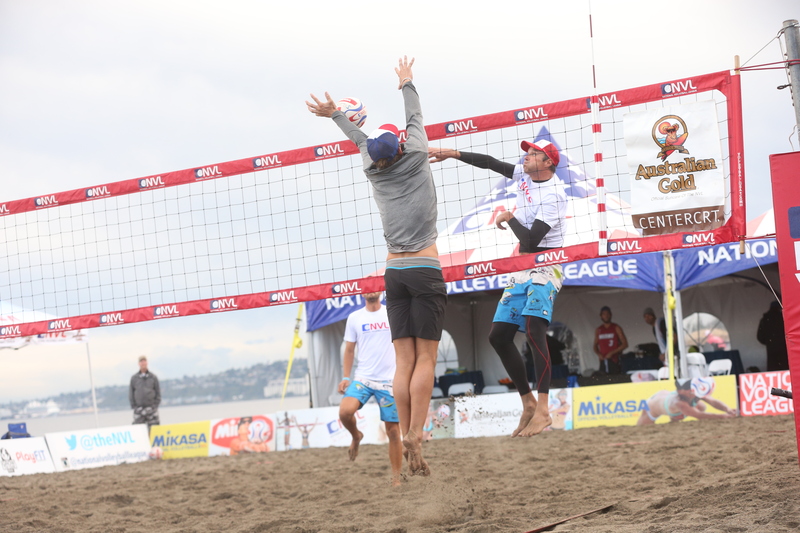 The tournament was held at Alki Beach from August 28-30 and featured top beach volleyball pros from around the world, including local Seattle players Deviny Mo and University of Washington commit Shayne McPherson, competing for a $75,000 prize purse. NVL hosted a free Clinic with the Pros on Sunday with more than 50 juniors participating. League partners Mikasa and Australian Gold were onsite throughout the weekend to hand out giveaways to fans. The Seattle Championships center court matches will be available to view free on-demand at the NVL Network. The Seattle Championships was the seventh of eight stops on the 2015 NVL tour. The season will conclude with the $100,000 Players Championships tournament at NVL Volleyball Academies/Club Med Sandpiper Bay in Port St. Lucie, Florida from September 25 – 27.